Masses of pure white flowers with sturdy deep green leaves; great ground cover. Wonderful ground cover with many pretty white flowers and heart-shaped leaves. 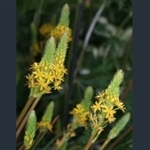 Dense racemes of starry, bright yellow flowers.